Note: This is an essay version of the notes I prepared for the the concurrent session “The Extension Educator’s Role as 21st Century Platform Builders” presented at the 2012 National eXtension National Conference, held Oct. 1-5 in Oklahoma City, Oklahoma. Many thanks to my colleague and co-presenter, Dr. Anne Adrian. I am deeply indebted to Steven Johnson, author of Where Good Ideas Come From, for many of the ideas explored in this text. What do two preeminent physicists and the father of html (hypertext markup language) coding have to do with a beaver? That’s easy: All four are platform builders. 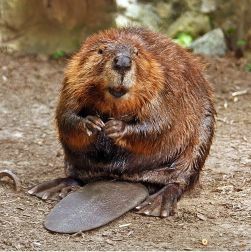 They built things that other people — or, in the case of beavers, other species — build on and use. There are a lot of different ways to define a platform. One thing they all generally share in common: They typically begin as rather desolate places that are transformed into hubs of activities. In biological terms, platforms, such as beaver dams and coral reefs, provide the building blocks for dense ecosystems. Dam building not only enhances the life of beavers but also provides habitats or foraging opportunities for a number of species: wild ducks, geese, kingfishers and swallows, to name a few. To an increasing degree, science writers and other social critics are gaining a deeper appreciation for how human-constructed platforms provide the bases for further tinkering and innovation. Among techies, a platform is a computerized system on which other developers can add hardware devises and software applications for particular purposes. However, famed science writer Steven Johnson also uses the term to describe the sorts of open, freewheeling communications environments that produce significant, often far-reaching intellectual, scientific or technological innovations. There have been lots of them throughout human history. One early forerunner of platforms: Seventh-century coffeehouses — boisterous places that provided the ideal environments for sharing ideas. Something rather remarkable and entirely unexpected followed from this interaction: The ideas exchanged within those highly fluid environments ended up mating and mutating into new ideas. Many of these ideas formed the basis for huge strides in scientific innovation which, in turn, secured immense material benefits for billions of human beings over the next 300 years. Why Are Platforms More Important than Ever Before? More than ever in human history, we are beginning to understand that the knowledge ecosystems that grow out of these platforms confer tremendous advantages in terms of creativity and innovation. They have driven human beings to higher levels of achievement. In fact, building these platforms and assuring that they remain the most open and generative as possible will be critical concerns in the 21st century for all sorts of entities, public and private alike. The last half century provides some remarkable insights into how platforms, by driving creativity and innovation, have contributed to huge leaps in scientific progress and achievement. Some notable examples include the Applied Physics Laboratory’s response to the Sputnik crisis, and Tim Berners-Lees invention of html. The efforts of a couple of physicists, William Guier and George Weiffenbach, to tract the 20 megahertz signal of the orbiting Sputnik in 1957 led to the development of global positioning satellite technology, which, in turn, provided us with Google maps and even the ability to post restaurant reviews on yelp.com. The work of Tim Berners-Lee is another prime example of the long-term advantages a platform can confer on humanity. Berners-Lee essentially built a new platform by stacking a series of older ones. His genius was using hypertext markup language to pull various computer applications together — or, invoking the platforms analogy, to stack one platform on top of another. Cooperative Extension can point to its own rather impressive history of platform building and stacking. In fact, we were platform builders more than a century before this definition was conceived. In our earliest days, we not distinguished for the innovation and creativity we could bring to bear on problems but also for the way these contributed to highly generative platform stacks. Extension itself is one layer of a considerably dense platform stack, built upon the Experiment Station platform as well as farmer institutes, which, in turn, were constructed on the older agricultural society model. Extension also borrows heavily from other platforms, including the “university Extension” model begun in England in 1866. Extension educators also helped build some of the most valuable platforms of the 20st century. Boll weevil eradication, which provided the basis for other platforms — crops entomology, crop dusting, crops scouting, to name only a few — is one of the greatest examples. Other platforms that were built off Extension or that borrowed significantly from it include the U.S. Farm Bureau system, public health education, applied home economics, 4-H, the U.S. Soil Conservation Service (now the Natural Resources Conservation Service), and community resource development. We have been building platforms, highly generative platforms, throughout our history. The problem is that the kinds of platforms we have built and continue build are not open and generative enough to meet the building codes of the 21st century. Why? Because we live in a world in which people are not only better educated but also better equipped to empower themselves and to build their own platforms without the assistance of highly credentialed educators. The highly generative capacity of new information media have only accelerated the trend away from more conventional forms of conventional outreach forms of educational outreach. Online engagement and the accelerating rates of social media adoption that accompany it are good things but we what we need most of all in Cooperative Extension is a change of mindset. We’ve got to learn how to combine our traditional outreach methods with social media techniques to assure that our platforms are the most open and generative as possible. But we’ve also got to understand how these new platforms will transform of clients from consumers into prosumers. In fact, they will no longer be clients at all but people who are actively involved in the design and planning of our educational products — prosumers. They will actively collaborate with us in building these new open, generative platforms. While we have been platform builders from the beginning of our history, factors have forced us to deliver many of our products in linear ways. We are currently defined by how we deliver programs rather than by how well we develop ecosystems — platforms — that assure optimal levels of sharing, serendipitous insights and innovative thinking can occur. In the future, we increasingly will be valued for the quality of our platforms. The more open and generative these platforms, the better. We helped build a global scientific farming model that has fed billions over the past century using older platforms. The human infrastructure we have provided within the last century has facilitated the sharing of critical knowledge in much the same way that railroads and interstate highways have facilitated delivery of the nation’s manufactured goods from place to place. The good news is that there is a stronger emphasis than ever on building technological infrastructure to secure the most optimal levels of creativity and innovation. The bad news is that we will no longer be a critical component of this infrastructure unless we find a way to build more open, generative platforms. Simply put, surviving in the 21st century will require our developing a more open-ended approach to outreach. We shouldn’t find that imperative all that threatening: historically speaking, we are simply being called to close the circle, to return to our roots. One critical need we will serve in the future will be helping our audiences deal with the tidal waves of words, symbols and data pouring out of their laptops, iPads and smartphones minute by minute, hour by hour. One of the most prized skills in the future will be the ability to collect vast amounts of information and assemble it into forms that they can use — the reason why our learning to be aggregators and curators will be an important part of platform building in the future. In the future, we will be valued more for the open-ended platforms we build than for the programs we create. What Will an Extension Platform Builder Look Like in the Future? Let’s imagine for a moment a techno-savvy 23-year-old Extension horticulture agent — we’ll call her Tamara — who determined to set the world her on fire her first day on the job. Soon after taking the reins of her new job, Tamara developed a gardening blog that covered all aspects of her field — one, she hoped, would develop into a definitive source for gardening information in her region. She links the blog to her Flickr account, which she uses to collect images of new varieties, planted diseases, and invasive species — anything of potential interest to her clients. In addition to operating a Facebook page with other local horticultural Extension agents, Tamara also has developed a hefty Twitter following. She tweets throughout the day, passing along observations about emerging home gardening issues, responding to client concerns and questions and sharing links to timely articles. Yet, she has not confined herself exclusively to virtual interaction with her clients — quite the contrary. Thanks to the influence of an older agent named Sam, what she initially undervalued — field days, conferences and workshops — she now prizes as valuable ways to connect with her clients and to articulate their needs. Without being fully aware of it, Tamara is transforming herself into a platform builder. The serendipitous insights she’s gained from interaction among large global horticulture audience have also help Tamara cultivate a deeper perspective about ways to enhance profitability of her local fruit and vegetable growers as well as the local farmers’ market. Conversely, she is beginning to appreciate how the global perspective gained through dialogue with her social media contacts will enable her to provide her local clients with a wider, multidisciplinary perspective. A number of older Master Gardener clients who are not adept at or are unfamiliar with the emerging communications technology are nonetheless impressed with the level of insight she brings to her conventional field days and workshops — insights she’s gained from working with a wider audience. Both her conventional and virtual audiences alike are impressed at the skills Tamara has developed as an aggregator and curator. Just as the two-way interaction with her diverse audiences has helped her refine her knowledge and to formulate new perspectives on age-old questions, Tamara’s skills as an aggregator and curator have enabled her audiences to make connections and to gain new insights into their work.